Alcohol may not be sold online to persons under 25 years of age. Prices are subject to change without notice. Dependent on products being available at the time of ordering. Prices quoted online include VAT. Delivery charges are quoted for orders placed for delivery within the UK and there will be extra charges for deliveries out of the UK. The consumer will be advised beforehand of delivery charges and has the right and option to cancel their order and have their money refunded should they not wish to proceed with the delivery. Web site prices may differ from our shop prices. Clerical errors on any invoice or document issued by Snoggys will be subject to correction without any liability on the part of the Company. 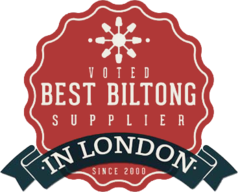 Boerewors is dispatched frozen. When unpacked, refrigerate immediately and cook within three days of thawing. We rely on an independent Courier Company as well as Royal Mail and cannot fully guarantee deliveries but will do our utmost to ensure goods are received on the day specified. All payments are in UK £ Sterling. We accept all major Debit and Credit cards and PayPal. We do not store your information online and are committed to protecting your privacy. We do not pass your information to any third party. All card details that are given to us by you the customer are processed on a secure server with HSBC. Orders may be collected from either Putney main shop at 367 Upper Richmond Road or at Wimbledon Station branch. Please call the main shop on 0208 8762050 to arrange this. For Wimbledon collection, orders must be placed 24 hours beforehand.